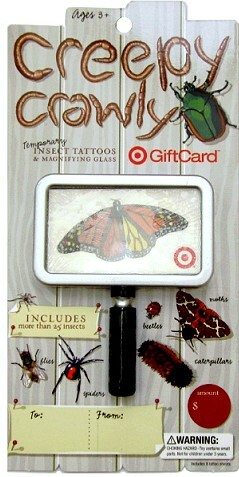 I’ve been really enjoying all these creative gift cards Target has been putting out lately! Love the awsome deals at target!!! Already like totally target ! Thanks !! Love the giveaway!! Here’s to hoping! thanks for the opportunity!! love reading your blog and all the target deals. love target and the coupons, my fav store. Thsi is a great giveaway. Target has great giftcards!!! I like Totally Target on Facebook. This is the best website!!! I would love to win this GC to Target, it is definitely my favorite store! I’d love to win this Creepy Crawly! I’m an avid TT site reader- thanks for the opportunity. I have liked Totally Target on FB for over a year! what a great gc! thanks for the chance to win! already “like” totally target on fb! I like Totally Target on Facebook very much! This giftcard is super cute. Thank you for fantastic giveaways!